Welcome all to the eigtht Foamy dodgeball tournament. 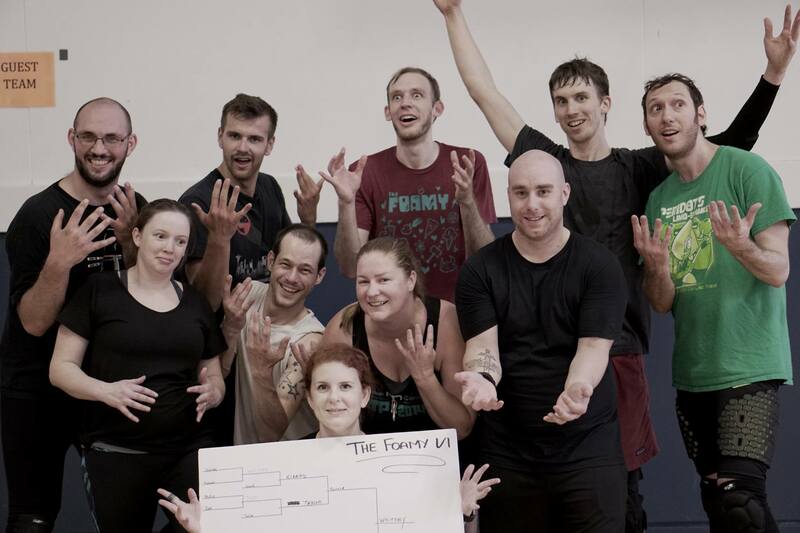 The Foamy is a quarterly Dodgeball Seattle foam tournament hosted by the people for the people. All proceeds collected during the tournament will funnel directly back into supporting the local foam dodgeball community, specifically, new balls for Greenlake pickup. This time around you get to bring your own three person team. There will be a full round robin and double elimination bracket. The entry fee is $75/team and a readiness to have a blast! Teams play with up to 2 men and at least 1 women on the court. The tournament is capped at 24 teams. Green Lake Community Center [map]. – Don’t let them catch your throw. – Don’t drop your blocking ball. – Last team standing wins! We play by the honors system. If you get hit, go out. Court officials will be there just in case you miss something. Having fun is our priority. We really love our dodgeball, but don’t cry over results. The round robin is meant to be a kooky mix of different rules, so don’t put too much stock in your seeding. If you have any questions about the league or dodgeball in general please don’t hesitate to ask. All participants play at risk of having fun.